The Ensign of The Church of Jesus Christ of Latter-day Saints, commonly shortened to Ensign /ˈɛnsaɪn/, is an official periodical of The Church of Jesus Christ of Latter-day Saints (LDS Church). The magazine was first issued in January 1971 along with the correlated New Era (for youth) and the Friend (for children), all of which replaced the older church publications Improvement Era, Relief Society Magazine, The Instructor, and the Millennial Star. Unlike some of its predecessors, the Ensign contains no advertisements. As an official church publication, the Ensign contains faith-promoting and proselytizing information, stories, sermons, and writings of church leaders. 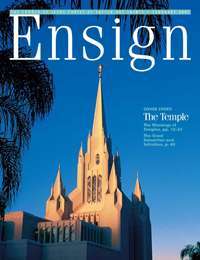 The May and November editions of the Ensign provide reports of the proceedings of the church's annual and semi-annual general conferences. These issues contain the full sermons and business of the conferences, as well as a current photographic list general authorities and general officers of the church. The text of every issue of the magazine is available on the church's web site. Each issue since January 2001 is also available in PDF format. 1 2 Rex D. Pinegar and Joe J. Christensen were co-editors in 1994.